Police will continue to stop and search photographers using their anti-terrorism powers despite Saturday’s mass protest by amateur and professionals in Trafalgar Square, the Home Office has said today. ‘The situation is essentially unchanged since the European Court ruling on 12 January,’ a Home Office spokesman told Amateur Photographer magazine this morning. 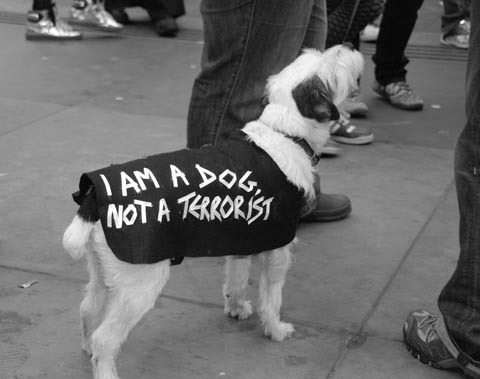 On Saturday thousands of amateur and professional photographers packed Trafalgar Square to demonstrate about widely documented heavy-handed treatment by police officers under anti-terrorism laws. The ‘mass photo gathering’ – arranged by the campaign group ‘I’m a Photographer, Not a Terrorist’ – attracted an estimated 2,000 participants and was hailed a massive success by organisers. The group was set up by professional photographers last year, in support of long-running campaigns run by other photographic bodies including Amateur Photographer magazine, the British Journal of Photography and the Bureau of Freelance Photographers. Among amateurs at the event was Andrew White who was stopped while taking photos of Christmas lights by two Police Community Support Officers (PCSOs) in Sussex last year. He told us: ‘This [Section 44 police power] is the thin end of the wedge. I hope people will see that this [protest] is not just about a couple of photographers. 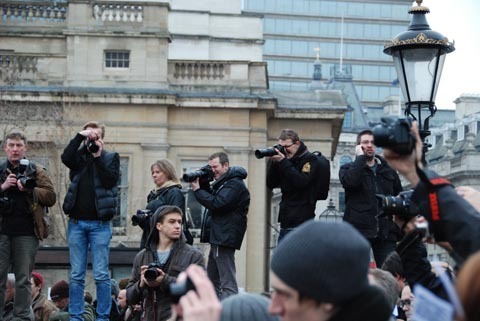 The Trafalgar Square protest made headlines worldwide and was supported by Amateur Photographer and many of the magazine’s readers, some of whom ended up appearing on ITV News. The night before the protest the government had raised the UK’s terror threat level from substantial to ‘severe’.